“Once the day began, Edwards took up his pen and dove into the life of the mind, writing sermons and treatises and reading books. He frequently interrupted his work, though, for interaction with his children, ‘to treat with them in his Study, singly and particularly about their…Soul’s Concerns,’ always being ‘careful and thorough in the Government of his Children.’ In response, his children ‘reverenced, esteemed and loved him.’ Edwards was not a perfect father, but the record of his family life shows that he did not selfishly shut himself off from his loved ones. As important as his work was to the pastor, it seems that his children took first priority. Their later flowering testifies to this. The girls married well and had numerous children who became Christian leaders and important social figures. The boys distinguished themselves as pillars of their communities and the broader New England region. The lives of successive generations suggest that the Lord blessed the Edwards home for its fidelity to Him” (70). Considered by many to be America’s greatest theologian, Jonathan Edwards (1703-1758) was a pastor, husband, father, the first president of what today is Princeton University, and credited with the First Great Awakening. On Monday it was like Christmas in the spring for me, because I opened up our mail box to find the Essential Edwards Collection, written and edited by Edwards scholars Owen Strachan and Doug Sweeney. The following quote is from the first book of this neat volume – Lover of God, a short, introductory biography. “He loved to study and to think about his life and world. But he was not lost in the clouds. 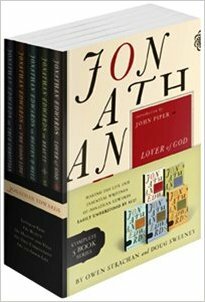 Jonathan excelled at putting his contemplative faith to practice. His deep thinking did not weaken his decision-making and his capacity to act – it fueled it” (37). I love how the authors make a clear connection between thinking and action. One ought to lead to the other, and this was no exception for the brilliant Edwards. So if it’s true that if you want to feel deeply, you must think deeply, as my previous pastor Joshua Harris once put it, then I believe one can also say, if you want to act vigorously, energetically, then you must first think deeply.